Are you uncertain whether you should choose Canon SL1 or T6? Don’t worry! You have come to the right place. In the following article, Canon SL1 and Canon T6 are going to be compared against each other in order to determine which camera makes the best value for the money. Both Canon SL1 and Canon T6 come from the Canon’s Rebel series, and, interestingly, the two DSLR cameras are currently available in a similar price range. This fact certainly arises questions. Are they really on par in terms of performance and output quality? How about the connectivity features? Continue reading below! In a glance, Canon SL1 and Canon T6 may appear identical. They share similar shapes and layouts. The placements of the buttons are very similar. However, Canon SL1 is already equipped with touchscreen control. Also, Canon SL1 is actually a little bit more compact than Canon T6. The smaller form factor may make it slightly more portable; unfortunately, people with large hands may not find it very comfortable to hold. Not to mention the smooth and less textured surface, which, while appealing, may make it easy to slip off from the hands. People with large hands will feel more comfortable handling Canon T6, which also happens to have better textured gripping surface. Both are compatible with the Canon’s STM lenses. Canon SL1 and Canon T6 have different advantages in terms of connectivity. Honestly, Canon’s DSLRs are not the most powerful cameras for making videos right now, but, if you happen to face a situation in which you need to rely on your Canon camera for a video, the SL1 may be handier. It comes with an external mic jack, which will allow you to capture high-quality audio. However, for connectivity with mobile devices and computers, the T6 can be more practical with the built-in Wi-Fi and NFC. 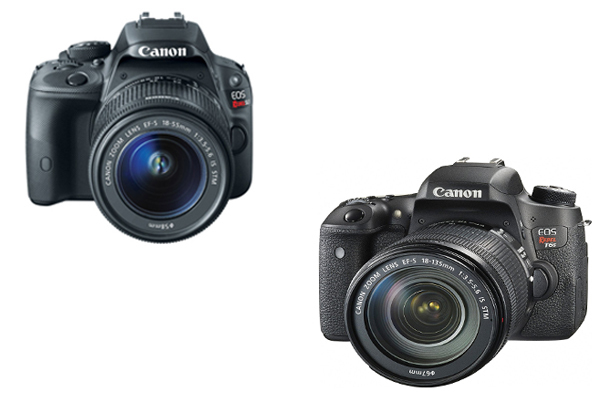 Canon SL1 and Canon T6 come with similar functions and features. Both support JPEG, RAW, as well as JPEG + RAW shooting. Both also support continuous shooting. However, Canon SL1 has a better edge here, as it has unlimited JPEG buffer and 4.0 fps continuous shooting speed. Canon T6 can only shoot up to 15 JPEG shots continuously, and the continuous shooting speed is 3.0 fps. Another notable feature of Canon SL1 is the on-sensor phase detection. This new technology enhances the performance of the AF system, especially in live view and videos. This technology hasn’t been implemented in Canon T6. - High-speed continuous shooting up to 5.0 fps allows you to capture fast action. In general, Canon SL1 makes the better choice, as it offers better performance with enhanced AF and unlimited buffer. However, for casual use, the Wi-Fi and NFC of Canon T6 can be handy and practical.